For more than twenty years, Sicflux has been present at the Brazilian commercial, residential, and industrial markets of ventilation systems. Highly recommended by contracting professionals for reliable, high quality, and innovative air renewal systems. Sicflux systems were the choice for many of the structures, like some arenas of the 2014 World Cup and 2016 Olympics in Rio de Janeiro, Brazil. Sicflux delivers complete modular ventilation solutions including: ducts, connectors, tubes, exhaust fans, ventilation grilles, airflow regulators, filter boxes, heat exchange systems, and accessories. Our product lines are streamlined to facilitate design and maintenance of your ventilation system. Sicflux can be found in large commercial buildings, hospitals, sports stadiums, airports. Be sure, we have the best choice for you project. The factory of Sicflux is located in south of Brazil and Sicflux have a warehouse and headquarter located in Pompano Beach, Florida to quickly delivery to US, Canada and some countries of Latin America. 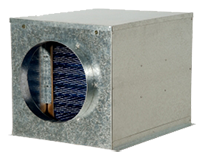 The Maxx fan line is designed to be installed over long duct systems to increase air flow when the space is limited. Can also be used for external air intake and reinforcement of hoods with filters. 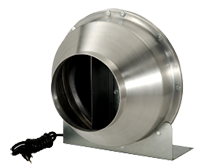 The ACI fan line was designed to exhaust or supply air in large environments. Can be used in multiple outputs at the same or different environments. Can also be used to reinforce long line installations. 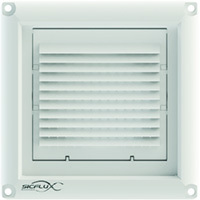 FILBOX filter boxes are designed to be used in outside air intake in conjunction with SICFLUX MAXX or SICFLUX ACI fans. FILBOX RED models have circular air inlets and outputs for connecting the exhaust fan. The available filters are constructed according to meet international Standards. The FILBOX line are made of highly resistant ABS plastic. The funnels that connect to the exhaust fan do not need tools, clamps, or tape. The access cover is designed for quick and easy filter replacement. The filters built into FILBOX are G4 and M5 class. FILBOX CA filter boxes are designed to be used in conjunction with SICFLUX MAXX or SICFLUX ACI fans. FILBOX CA are designed with an activated carbon filter to make the circulation of air in closed environments, eliminating odors and improving air quality. 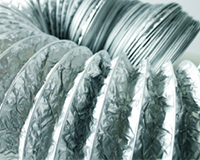 Flexible aluminum foil duct can be used in a variety of general purpose exhaust and ventilation applications. Made of aluminum foil laminate structured with steel wire. Highly flexible and compressible. 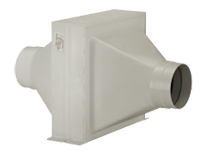 The new SICFLUX Fixed Plastic vent hood can be used in exhaust fan or dryer exit and in any other application that requirer a finishing at a duct or Opening. 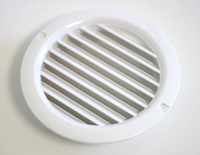 SICFLUX RVA air diffusers are ideal for in-wall or suspended ceiling applications. 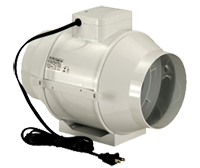 This product allows for fresh airflow and features a lock nut for secure air flow balancing. The air diffusers require no studs for installation when used with FixAR system. 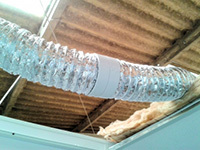 The new line ConnectFlux, facilitates to make the junction between flexible ducts, not requiring the use of any kind of product, such as adhesive tapes. Forget the old metal sleeves that are highly corrosive. The ConnectFlux is made with 100% ABS plastic and are more lightweight, flexible and easy to transport and use.